The ideas and terminology of Darwinism are so pervasive these days that it seems impossible to avoid them, let alone imagine a world without them. But in this remarkable rethinking of scientific history, Peter J. Bowler does just that. He asks: What if Charles Darwin had not returned from the voyage of the Beagle and thus did not write "On the Origin of Species"? Would the absence of Darwin's book have led to a different sequence of events, in which biology developed along a track that did not precipitate a great debate about the impact of evolutionism? Would there have been anything equivalent to "social Darwinism," and if so would the alternatives have been less pernicious and misappropriated? In "Darwin Deleted", Bowler argues that no one else was in a position to duplicate Darwin's complete theory of evolution by natural selection. Evolutionary biology would almost certainly have emerged, but through alternative theories, which were frequently promoted by scientists, religious thinkers, and moralists who feared the implications of natural selection. Because non-Darwinian elements of evolutionism flourished for a time in the real world, it is possible to plausibly imagine how they might have developed. Bowler's unique approach enables him to clearly explain the non-Darwinian tradition and fully elucidate the ideas of other scientists, such as Richard Owen and Thomas Huxley, whose work has often been misunderstood because of their distinctive responses to Darwin. 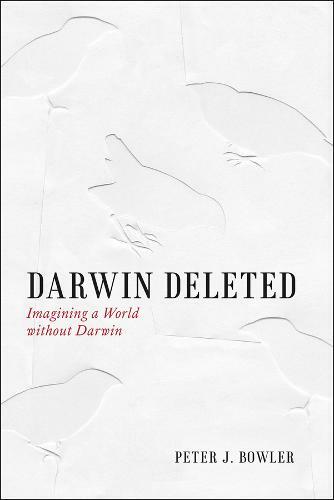 "Darwin Deleted" boldly offers a new vision of scientific history. It is one where the sequence of discovery and development could have led to an alternative understanding of the relationship between evolution, heredity, and the environment-and, most significantly, a less contentious relationship between science and religion, avoiding the polarized attitudes that shape the conversation today.